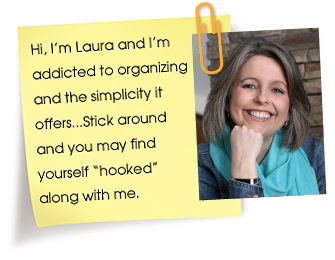 Hi friends, I’m a huge believer in doing organizing projects in manageable chunks of time. So many people just get overwhelmed otherwise. If you have a large space you want to tackle, break the steps down into 5, 15 or 30 minute tasks. For instance if time or attention is short, planning a whole closet overhaul is probably not the best way to go. Instead plan to spend 5-15 minutes a day purging clothes from your closet that you no longer love or that fit. Or spend a few minutes organizing scarves or belts or shoes. Eventually your closet will get done even if it does take longer than if you did it all at once. But you know what? You do what you can do. Occasionally I like to show you small organizing tasks I do around my own house. Yesterday it was my nightstand drawer in my bedroom. It’s been bugging me for awhile but, unlike other areas in my house that I see all day long, my nightstand only reminded me it needed an overhaul at bedtime. At this point I was always too tired to care. Then the other day when I was in Winners/Homesense (they are all one store here in Canada) I found these divided containers and felt the inspiration looming up inside of me. I had to have them and bought them both because well I couldn’t resist. Gosh I can’t even tell you how happy a little divided container makes me. Whoot!! Here’s the before picture of the drawer with random crap thrown in over time. As you can see I did have a basket in there to corral items. The problem wasn’t the basket really but rather a case of neglect. Yep, it happens to all of us. Don’t sweat it, just tackle it! It’s not organized and done, it’s organized and see you soon! When I dumped my drawer out onto the bed I found THREE sets of earphones. THREE because apparently I’m some kind of earphone hoarder. I didn’t even know I owned that many! I also pulled out of there two reading lights, you know the kind that clip onto a book. Ummm that’s weird because I don’t use reading lights. I also found oh about 40 bookmarks, for you know that time where I have forty books going at one time???? I mean it’s not unusual for me to be reading multiple books at once but FORTY? Let’s not get crazy here people! Do you see what I mean about random? Sheesh! So after a little purging and a brand new shiny divided container(!!!) I am once again a happy girl with an organized nightstand drawer. For curious minds, I have tucked in the back my sleeping masks and night cream. A notebook for pre-bed brain dumps lives underneath the tissue box. The top left section has ear plugs and earphones and the section underneath that holds small post-it notes for quick notes. The section to the right houses my electronic cleaning cloth and a small light. 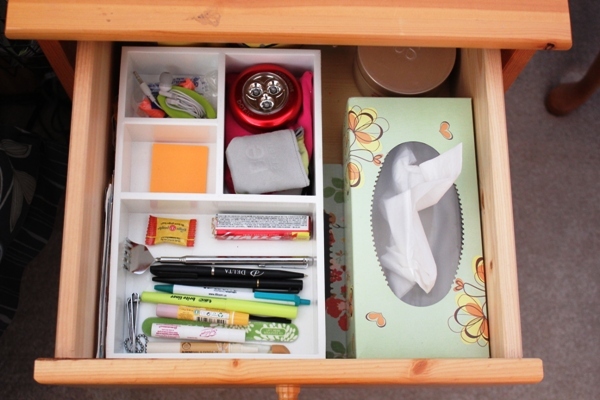 The big front section holds pens, highlighter, nail file, nail clippers, lip balm, cough candies, etc. The few bookmarks that I did end up keeping I slid in on the left side next to the divided container. If you need some quick organizing ideas, I have a slew of 30 minute and even 5 minute organizing tasks pre-loaded into my organizing app that can get you started. If you don’t like the choice given to you, then just shake your phone and a new one will pop up for you! 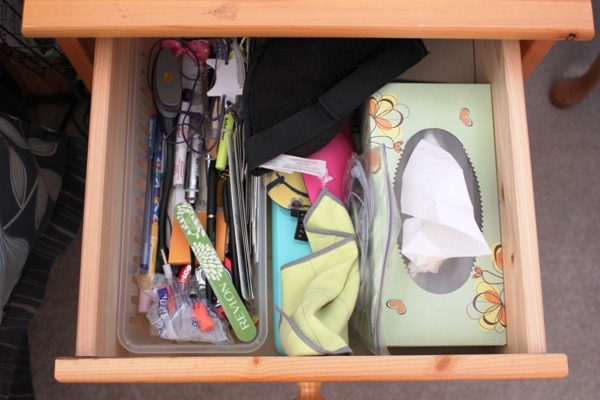 What quick organizing tasks can you do in your home right now? Isn’t there something so empowering about those 15-20 minute organizing sessions? I totally agree that doing something is always better than doing nothing. Thanks for the inspiration! The best kind for sure!!! Have you seen Drawer Decor Melissa? I use their clear containers in my utensil drawer on top of one of their mats. You can arrange them however you want. Very cool. Thanks! I’d forgotten about those, I’ll check them out. I see stackable acrylic containers too, those might work perfectly. I have a really tiny notebook in my handbag with measurements of anything that can take storage. Example:- draws… I have what set how wide, deep and high. Shelving spaces some measurements. Obviously only of areas that need improving. 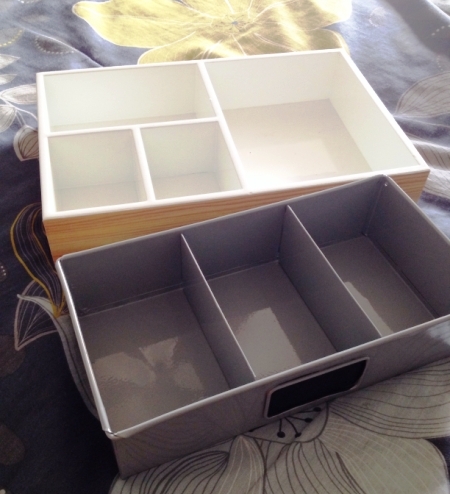 I hate finding something that might be suitable storage but not knowing if it will fit. Anyway – the ‘little book of measurements’ has helped me a lot. I also keep a small tape measure in my bag. This is genius. I have a small tape measure in my purse, but a measurements list is brilliant. Love this. I have lived by the 15 minute rule for years. I was first challenged by the idea reading Emilie Barnes. Oldie but goodie. I have to admit though I often have to motivate myself or remind myself that some “big” things can be done in 15 minutes-and what a sense of accomplishment I feel! Thanks for the reminder. I was in need of it. You’re welcome! A little motivation sure goes a long way!! Sorry this is kinda long but I thought you might get a kick out of it. I did try to declutter my nightstands and included a ‘brain dump’ pad. The first night I wrote “job search” because come 2015 my company is merging with another and I will most likely lose my job. That night I had a dream that was rather profound. My mom and I were driving in her car and she took a road that had gotten washed out due to a storm. The car got hung up on some craggy rocks. We got out and started to walk back to the main road. A tow truck/flatbed came by to rescue another car that had the same thing happen to them. They told us they’d call in our car and to go wait by the road. My mom and I looked at each other and we agreed – everything will be alright. I took that as a sign I’ll find a job and everything will be alright. That was a cool trick, the brain dump book. I’m going to do that at least once a week. Thanks!! I love the idea of organizing in short periods of time. With life the way it is who has all day to organize anymore? 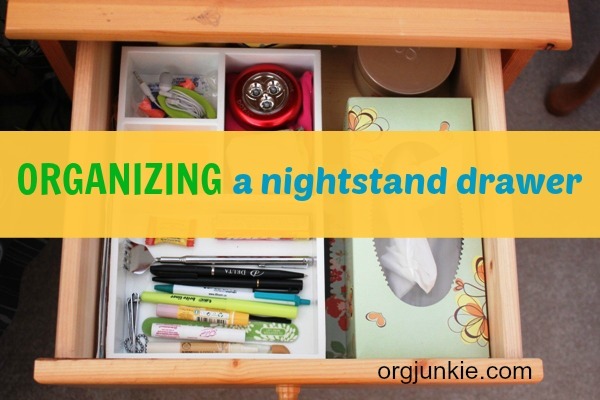 Your nightstand looks amazing, I love the container and how everything has its own compartment. Thanks for the great ideas!